I took this dish from a really tasty Mango Coleslaw recipe that makes a great side at any summer grill out. 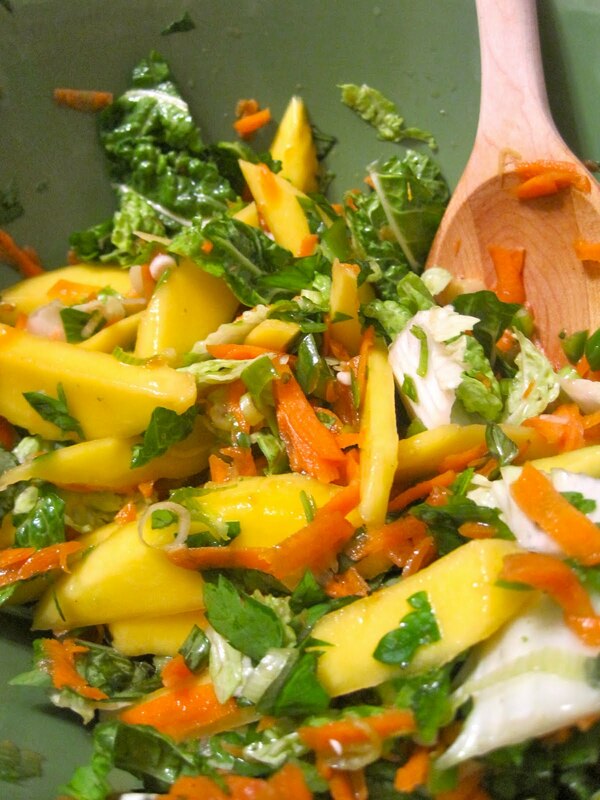 Sliced mangoes, carrots and onion are mixed with fresh basil, mint and cilantro and tossed with a tangy Asian vinaigrette; diced jalapeno adds some spice to the mix. Because this slaw is vinaigrette based rather than mayonnaise based, it fares on the lighter side. I was craving the dish for dinner but knew it wouldn't fill me up, so I pan-seared some tofu in soy sauce, cut up a head of Chinese cabbage, tossed in some whole-wheat linguine, added a few crushed honey-roasted peanuts and voilà! Mango-Cabbage Noodles with Tofu was born, a tangy Asian noodle bowl of pure deliciousness. I'll list both recipes below so you can choose to make this dish as a side or a main. Enjoy! Mix first 5 ingredients together in a large bowl, and remaining 5 ingredients together in a small bowl for vinaigrette. Add the vinaigrette to the large bowl and stir together. Drain tofu by placing a double layer of paper towel around the block to press out excess water. Cut the tofu into bite sized squares. Heat 1 tbsp oil or spray a thin layer of olive oil spritzer in a pan on medium heat. Make sure the tofu are arranged in a single layer with some room in between, and cook covered for 3-4 minutes, or until the bottom is golden. Add the soy sauce and flip, cooking on the other side for 3-4 minutes. Cook pasta according to package directions. Combine Mango Coleslaw, Cabbage, Tofu, and Noodles in a large mixing bowl; sprinkle with honey-roasted peanuts for garnish. For optimal noodle slurping, eat with chopsticks.